Holiday decorations set the tone for a cheerful home environment. Easter especially is a time for families and friends to celebrate new beginnings. When setting the table for Easter dinner, it's essential to make each guest feel welcome. One unique way to do it is to create personalized Easter place settings. While the idea of a personalized place setting sounds costly, the DIY approach to this project won't put a dent in your wallet. If you have plastic Easter eggs and twine around the house, you're off to a great start. Grab a few more supplies and get ready to impress guests this Easter. 1. Squeeze hot glue on the top of a plastic egg. 2. Place the loose end of a piece of twine on the hot glue. Allow the glue to dry. 3. Coil twine around the first piece of twine glued in the previous step. Squeeze a dot of glue to adhere the twine to the egg. 4. Continue coiling the twine around the circumference of the egg. 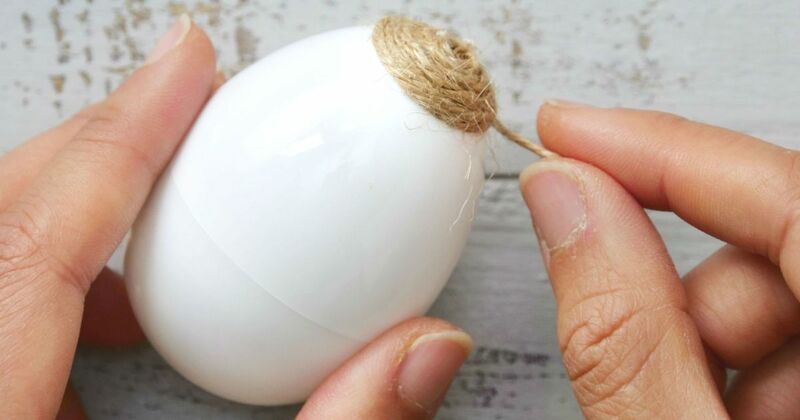 With every turn of the twine, use the glue gun to ensure a strong bond to the egg. 4. Wrap the entire egg with twine from top to bottom. 5. Snip twine to release it from the spool. 6. Draw four circles around the circumference of a wood bead with a black marker. 7. Snip 6 to 8 inches of craft wire with wire cutters. 8. Push the craft wire through the wood bead. Adjust the wood bead to position it approximately 3 inches from the top of the wire. 9. Bend the top of the craft wire and feed it back through the wood bead. The left side of the bead should now appear to have a wing. 10. Twist the right side of the wire fed through the bead in the previous step. The goal is to give the appearance of another wing on the right side of the bead. The bead should now resemble a bee on a wire stem. 11. Slip the wire stem through the twine on the plastic egg. The bee should look like it's hovering above the egg. 12. Snip a small piece of artist tape from the roll. 13. Stick the tape to the side of the terracotta planter. 14. Write the name of a guest on the tape with the marker. 15. 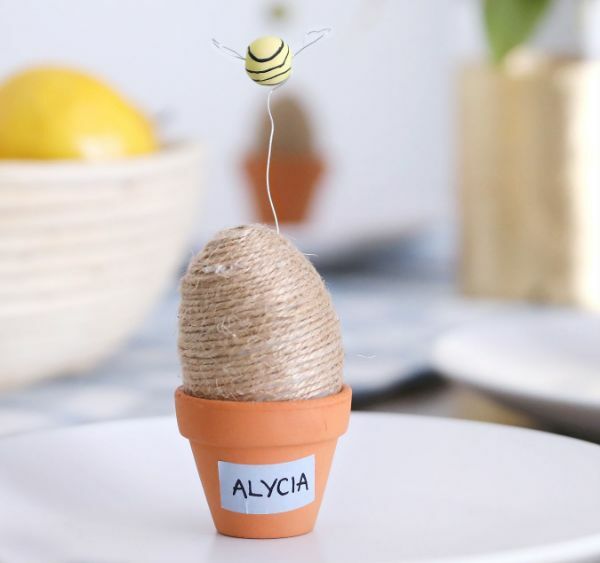 Place the twine-covered egg in the terracotta planter. 16. Place the personalized place setting on a dinner plate to welcome your guest.